How did I do it? For that, you’ll have to wait just a little longer until I have a full post up on the experiment. But I can certainly reassert (as I do over, and over, and over again) that it is all about energy, not the cholesterol. Energy is the primary driver and cholesterol the passenger. I had originally not planned to come to this convention given I had an existing commitment. When that canceled in the weeks before, I let Brian Williamson know I was planning to come and he invited me to speak as well. It was at that point I decided to arrange the experiment to meet the challenge. I was especially happy to catch so many people I connect with online for encounters in person. I was reminded once again of how many wonderful people are in this community that I’m honored to know. In fact, I’d list several of them off, but it would take up too much of the blog post (and the day) to recount them all. 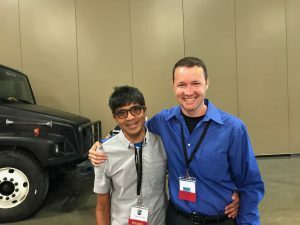 I do need to give special emphasis to Nadir Ali, who I had been in contact with before and had many great conversations with at the conference. His presentation was spot on and he has an excellent grasp of the many nuances with lipidology and how it applies to his field with cardiology from a low carb perspective. Unfortunately, there was a massive computer crash during my presentation that took my slides offline for several minutes. I tried to stay on script with the presentation sans visuals and keep speaking in spite of the drop-off, but I’ll concede it was quite a challenge and my pacing was completely thrown off. 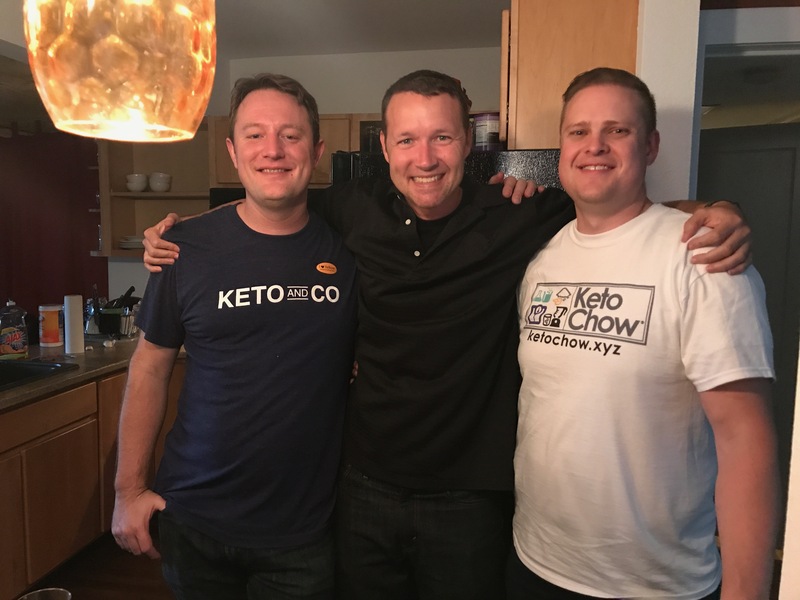 I have to give a special call out to Keto and Co and KetoChow, both of whom have supplied their product for some of my recent experiments. As with any company I work with, I take no direct compensation, nor do I promise anything in return. But to the credit of each, both were interested in helping to advance this science with no expectations of endorsement. Best of all — while they are technically competitors, each company is full of people who know and engage each other. In fact, this picture was taken at an afterparty by Keto and Co which invited all the KetoChow employees to come join us. I’m fortunate to know two small businesses that care more about advancing the science than eeking out every possible competitive advantage. Good people! Fascinating numbers! I truly am at the edge of my seat wondering what produced these changes. Thank you for your incredible investment in the science of lipidology. In 20 years of practice I have never had as much fun as I am now helping people to lose weight, control their diabetes, and feel better with low carb eating strategies. Now, through your work, the work of Ivor Cummins, and many others I now look forward to truly understanding lipidology. Thank you for your very generous contributions to the science for the help of others! What about grams of protein ? Or 80 grams per day? Subtract egg whites at 5 grams of protein’s each? I haven’t done a lot of experimenting on extreme protein lowering. But as an aside, I find when I accidentally have a lower than usual protein day, I don’t feel as happy overall. Who knows — it might just my missing the meat fix. I have heard that cholesterol can be high when you are losing weight. I have also heard that my Hoshimoto’s Hypothyroidism could be distorting the numbers. The only other thing that I can think of is that I play very intense basketball 2-3 times per week for about 2.5 hours each session (over exercise?) I am going to get a CT calcium scan at the end of this year when I turn 40. I doing what I can to fight the auto immune attack on my thyroid. My small ldl was 1500 two years ago with trigs at 159 and hdl at 55. I feel really good after the weight loss and I can probably only lose another 15 pounds. I am glad to see my trigs/hdl number dropping and my last reading was the best ever in the 3 years that I have been getting blood work. I clearly have some inflammation and am hoping it is not heart related and is instead coming from Hoshimotos or a parasite or something. I am almost done with my 3rd book on Thyroids and I am trying to fix that first. I feel like I have found the right diet for me and I look and feel better than I have in years. My cholesterol numbers have been high for the 3 years I have numbers. Although they are getting better, I can’t seem to determine why they are still so high (especially with my strict LCHF diet). If you can point me to a book/study/article I would greatly appreciate it. If you think I need to get blood work done again soon because of the further drop in weight, I will and will get back to you. Thank You. Sorry to hear about your challenges with thyroid. I know it’s a powerful hormonal regulator and can be difficult to get just right. I’m not sure if I’m getting the timeline right… but it sounds as though you’re saying your numbers were high two years ago when you were *not* keto, is that correct? Regardless, it can be a good idea to get a CAC scan soon so you “bookend” what your score was pre keto vs after keto. The resources I could point you to generally fall in pro- and anit-low carb diet sides. Many insist having big fluffy vs small dense LDLp is all that matter and to only pay attention to Trig/HDL ratio. I’m more reserved on all of that given what I’ve been learning with my own data. Basically, I can’t trust *any* study that doesn’t at least tightly control for the participants’ diet in the 3 day window before each blood draw (which is almost none of them). I think most people would trust someone looking lean like you, rather than the high-BMI specimens standing next to you – especially when it comes to selling a product supposedly showing the superiority of ketosis.